The 2011 Audi A8 continues to set the full-size sedan gadget bar higher with the integration of Google Earth and terrain-mapping into its 8-inch LCD screen. Now you can find a Starbucks... in 3D! Audi's system will use a UMTS modem to allow data transfer for the navigation system, downloading maps and integrating Internet search into the multimedia interface so a user can ask it to search for "Cabinet maker" and then pull the results up on the display. The onboard computer also matches street data with the Google Earth 3D terrain model to provide route guidance over the map. A few years ago this was show at CES as a future concept. Well, the future is here. In early 2010 Audi will be bringing the next generation of the A8 to the starting line. The new flagship and its online services further demonstrate the brand's proverbial Vorsprung durch Technik, by bringing a variety of Google services and information to the luxury sedan via the internet. The services will be available in selected markets. In mid 2010 Audi will further enhance its suite of online services with a new UMTS modem. This enables faster data transfer as well as simultaneous voice and data connections, and allows Audi to set a world first with the integration of Google Earth in the MMI navigation plus. High resolution three-dimensional satellite and aerial imagery for the entire globe and a worldwide database of photos and information articles are only some of the fascinating new features. 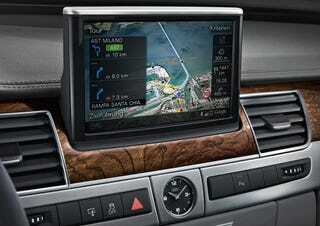 With Google Earth on the MMI's 8 inch LCD display the new Audi A8 allows its occupants to discover the world from above. The Google Earth imagery and 3D terrain model are combined with the detailed street network from the onboard navigation database as well as calculated routes in a seamless integration of online and offline content.